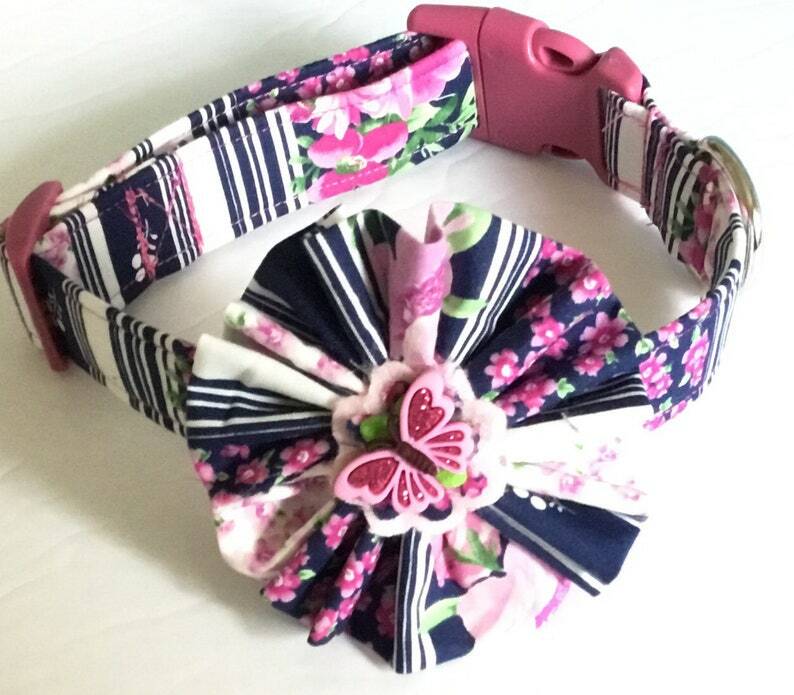 This listing is for a Navy Blue, Pink and White Floral Striped Collar with a Matching Flower for your Girl Dog or Cat. The collar is available in a buckled or martingale style in the options when ordering. Pink raspberry collar hardware was used on this collar but metal is also available as an upgrade. A matching 5 foot leash is another available option when ordering. I have added a pink felt floral motif to the center of the matching flower with a butterfly button within the middle. (All center decorations may vary depending upon stock availability and size of flower collar selected.) The The flower attaches to the collar by way of wraparound velcro which is additionally supported by felt for longer lasting strength and durability of the flower. All my collars can be made in all sizes including XXS, XS, S, M, L, XL, XXL with option width sizes of 3/8 inches for toy dogs or cats ( Cats receive collar breakaway hardware unless otherwise requested), 5/8 inches, 3/4 inches, 1 inch or 1.5 inches.